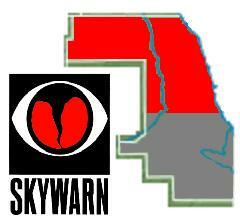 Northern Cook Co. Skywarn is a joint effort between members of the North Shore Radio Club, NORA, and Palatine ARES. Severe weather nets take place on the primary 147.345+ MHz (TPL 107.2 Hz) repeater. The NORA 147.09+ MHz (TPL 107.2 Hz) repeater is the backup repeater if 147.345 is down. Spotters may check into this net during severe events. Net control will operate with callsign WX9NC. All severe reports will be relayed from net control to the FISHFAR liaison system as encouraged by the NWS. Reports will be taken from anywhere within the repeaters' coverage, however, we will actually only activate based on severe weather for Northern Cook County. Below is brief description on how the repeaters will operate. NORMAL MODE (condition green): An advisory for Northern Cook Co. is issued by NWS Chicago or no severe weather is expected. Repeater will be operational as usual. RESTRICTED MODE (condition yellow): A severe thunderstorm watch, tornado watch, or flash flood watch is issued for Northern Cook Co. by NWS Chicago. Severe weather will likely occur in our area. Please keep all conversations to the point on the repeater and be prepared to relinquish the repeater to net control should the watch be upgraded to a warning. DIRECTED MODE (condition red): A severe thunderstorm warning, tornado warning, or flash flood warning has been issued for Northern Cook Co. by NWS Chicago. This means severe weather is occurring in our area. Take cover. The severe WX net will be operational at this time and the repeater will only be open to emergency traffic, severe reports, or questions about the storm. No other traffic will be permitted on the repeater. All traffic must go through net control. The repeater will have a CW "W" courtesy tone and a "weather net" voice ID every 10 minutes. Don't call in just to "check-in." This is not a roll call net. Call in if you have a severe event to report, question about the storm, or	you need emergency help. If you do not have a notable weather report of interest to the general public, just listen. Don't call in and say "KC9AAA... I'm on my way to Woodfield Mall and will be monitoring." No one cares	if you are on your way to the mall or where you are unless you have a notable weather report. You may be tying up the frequency unnecessarily just announcing where you are. Don't call in that your corner sewer is clogged. Don't ragchew during severe nets. Even casual QSOs are prohibited during severe nets. Do call net control if you are bike riding, boating, golfing, your kids are playing outdoor sports, or if you're part of a marathon team and you would like to know more about the storm's path or intensity forecasted by the NWS. Do report your name/call, location, and describe the event. WANT ANY MORE TIPS? : On the left menu is a link called "Submit an Observation and Daily Totals." Spend some time there and learn what is severe. The Northern Cook County net is especially interested in hearing	from you about severe weather, but we will occasionally take non-severe reports such as penny-sized hail, large	broken tree branches, or other RARE items which may be of interest to the general public. IN SUMMARY, THINK: Before keying the mic during a severe event, How will your report help the National Weather	Service in forecasting severe weather or prepare others?